When you are working with social media without a clear strategy and plan, you’re operating in the blind. Without a plan and objective, how do you know how well you are doing? How do you know how you can improve when you don’t have the objectives and the plan to begin with? A social media strategy works like a map that guides you to where you are going, and helps you get to the final destination in the best possible way. When you have a strategy, you also know when you’ve taken the wrong route and if you should turn around and get back on the initial road, or if the new road is actually one you want to take. When you have a strategy, you’ll be able to clearly know not only what you want to achieve, but you’ll also how you’re going to get there, as well as the why’s. It’s easy to get caught up in the busy world of social media, and it is even easier to end up spending a ton of time there. Unfortunately not always for the better. When you have a strategy, you’ll know exactly what needs to be done, how you’re going to do it, and whether or not you are following your initial plan further down the road. Your strategy ensures that you are on the right path, and don’t end up looking at metrics that are irrelevant to your end goal, such as comparing your number or likes with your competitors, or looking at their number of followers and seeing that as a truth that they are more successful than you. In this article, I’ll give you 8 vital questions you need to ask when creating your social media strategy that will help you reach your true potential. This is the question that is the foundation to your social strategy, but also the foundation to any business effort you make. You cannot advance and move forward if you don’t know what you are working toward. Social media can do a lot of things for your business, and it can quickly become like a buffet when you are hungry. You end up taking a bit of everything even if half of it isn’t tasty. Either way, to decide your business goals with social media, you need to look at your company’s main needs, narrow them down to a few primary goals, and a few secondary goals, and then decide how you can implement social media in your strategy to reach those goals. The metrics brand awareness, customer retention, and using social media to reduce your marketing costs are three metrics of social media that is relevant to any brand, and with social media, all of those metrics can be worked towards. 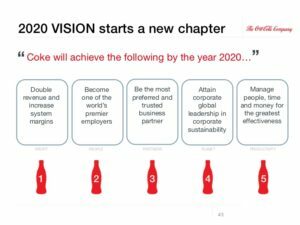 As you can see with Coca-Cola’s goals, they are quite large, and can be worked on from many different ends. Your marketing objectives should be clearly defined and explained so your goal to when they should be achieved. Or, more correctly, if you achieve them. In other words, if your social media efforts are the right for your goals so you’ll be able to a achieve them at all. If your main goal is to increase customer retention, how many returning customers are you hoping to get as a result of social media? When will you consider that goal reached, and how will you measure it? The general rule of creating goals is to make them SMART. Simply writing “Increase sales” in your strategy just won’t cut it. Then, your goals aren’t specific, measurable, nor achievable. Instead, your goal should in this case be to increase sales by 50%, for example. 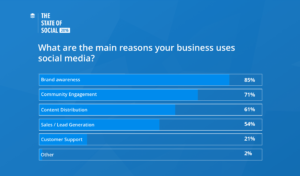 Here are the top reasons businesses use social media. If it is customer support, a goal could be to help 500 customers by providing them with answers they get happy to receive over the period of one year. What you also need to do is to set realistic goals that are actually achievable. Yes, you should reach for the stars, and you shouldn’t put any limitations to what you can achieve, but when setting marketing goals for your business, goals that are completely taken out of the blue, such as increasing sales by 5000% with social media isn’t a recipe for success. You’ll only end up being disappointed. On second thought, increasing your sales by 5000% might be possible, but it isn’t possible in a short timeframe. Therefore, your goals also need to have a time frame on when you are expecting to reach them. Since social media is ever evolving, and rapidly changing, your social media strategy needs to be equally so. If years go by, but you are still using the same strategy as you did 5 years ago, a lot of things will have changed, and the chances are that your strategy will be more or less out of date, compared to what the social landscape looks today. Therefore, a good timeframe that your social media strategy should have as a maximum time frame is 1 year. After that, it is time to change and tweak both your goals and the tactics you are going to use to reach them. In fact, chances are, your company will have evolved a lot in one year as well, so if you are working year in and year out, towards the goals you set a long time ago, they might not be relevant to your brand’s needs today. It’s important to know that the timeframe of your goals isn’t the same things as the timeframe of your social media marketing strategy. The life length of your social strategy is often longer than one year, because there are many things and goals in business that always stay relevant no matter how much time passes by, but when you are evaluating your goals, taking a quick glance at how up-to-date your strategy is will let you tune it to perfection. As a business, you’re dependent on your customers. No matter if you’re a B2B or B2C company. Therefore, it is vital that you identify the people who are most likely to be interested in your brand’s product or service so you can know exactly how you’re going to reach them in the best possible way. A common reason to why brands are failing on social media is because they don’t reach their target audience, and aren’t looking at the right places to do so. 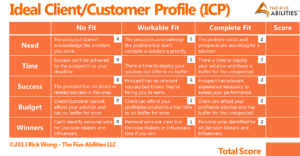 When you have a buyer persona, you’ll know exactly who you are going to target, how you are going to target them, and where they are to be found. And that’s exactly what your social media marketing strategy is going to tell you. The more specific and descriptive your buyer persona that describes your customers is, the better you’ll be able to reach them, and reach them with messages that resonate with them. When your buyers persona is specified to perfection, you’ll also notice that the conversions from your social media platforms will increase. To make it even more specific than the points mentioned above, identifying things like age, interests, gender, problems, location, income, and obstacles is not only helpful, but it is critical so you know you are spending your efforts on the right people, and that you are reaching them in the best possible way. It is said that you should focus on your own race, rather than looking at what everyone else is doing, and it is completely true! You never see winners looking at their competitors. Instead, they are focusing on their own race and doing their own thing. When you are constantly going through the day afraid that someone will surpass you, that’s also what will happen. 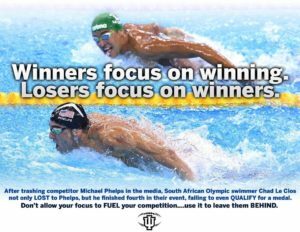 A famous quote that I love is “Winners focus on Winning, Losers focus on winners”. While you should mind your own business and focus on winning, there’s nothing that prevents you from learning from the winners to understand what makes them so successful. When setting up your social media strategy, identifying who your competitors are and acknowledging what they are doing is extremely helpful. Your competitors will give you an idea on what is working so that you can incorporate their strategies into your very own strategy, and then improve them. By now, you should have a few businesses that are your main competitors, in mind. In your social strategy, list a few of your competitors, and note things like posting frequency, what platforms they are using, and also simple “success” metrics such as their followers and engagement. Looking at their engagement will give you a more accurate image of their social media success. If you are looking at competitors who have tons of followers on social media, in belief that they know the recipe for success, without bringing in engagement into the equation, you risk getting a faulty picture. They can have hundreds of thousands of followers on social media, but if they receive close to non-existent engagement, it’s a sign that their followers either don’t care about their brand, in other words aren’t their ideal audience. Or, it can be a sign that the brand is posting content that their target audience simply don’t care about. Another important aspect of your competitors is the content they are sharing. Your competitors have the same target audience as you, so look at their content to understand what resonates well with your audience. If your competitors is sharing humanistic videos around their products, chances are, you’ll generate great results from it as well. Which social platforms you choose is important. There’s a myth that still lives on today, and that is that the more social platforms you use, the better. In other words, you should be active on every single social platform you can get your hands on. And it’s easy to understand why this myth lives on. The more places you display your business on, the more people you’ll reach, right? Unfortunately, people are still, to this day promoting this message, and this is of course concerning, because it isn’t true. In fact, you’ll be far better off focusing on a few social platforms that are relevant to your business and target audience. The truth is that not all social platforms are the same. 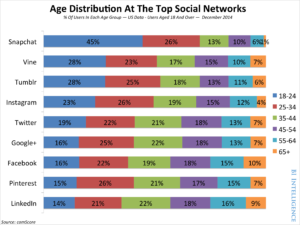 Nor is it true that all social platform’s demographics are the same. This means that on some platforms, your target audience might be nowhere to be found. And in those cases, investing efforts and resources on building a presence on those platforms is a complete waste of your time. Also, managing social media is extremely time-consuming, and therefore, you should only have as many platforms as you are able to manage. It is better to dominate a few than to put in below average effort into plenty. It’s like trying to learn how to play bass, guitar, flute, and piano at the same time. Yes, you might learn to play a few verses and the most basic songs, but it is far more beneficial to become an expert at one or two of them. Here, your competitors are helpful once again. By looking at what platforms they are using, and studying which platforms provide them with the best results, you can choose the platforms that will generate the best results for your business, and give you the best prerequisites to succeed. What decides which platforms you should focus on is where your target audience are. Because that’s where you need to be present. 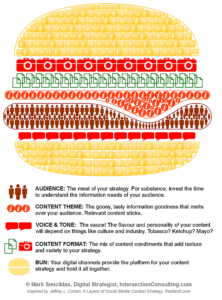 The content strategy plays a vital role in your social media strategy. On social media, content is the foundation to the success. In fact, all social platforms are based around content, and if you don’t share it, you are basically non-existent to your audience. How else will they find you? Sharing content is of course not everything. Because social media has become so saturated, you need to share amazing, high-quality content to succeed. The type of content you should share depends on several things, and the most important one is of course your audience. What type of content do they resonate well with? The second is what type of content works best on the platform you are using? For most platforms, visual content is dominating the game. And it’s not strange considering the fact that 90% of information transmitted to the brain is visual. Your content strategy, which is a part of a bigger picture – which is your social media strategy should answer the three questions above, and many more. What visual theme am I going to use? What brand message do I want to convey? How much promotional content should I share? The reason you should acknowledge the time of your posts is because posting at a time when most of your audience is awake and online will make more people see it, thus leading to a greater impact and a higher engagement. However, this has less and less importance due to the algorithms most social platforms use, which sorts content in people’s feed based on other factors rather than the time they were uploaded. What is your budget and what resources do you have? Social media can be completely free, but it can also demand a lot of invested capital. In your strategy, you need to plan if you are going to use paid advertising to help reach your objectives, or if you are going to completely rely on organic reach, and reach new audiences by running other types of campaigns such as giveaways. In that case, you need to note what you will be giving away and what it will cost you. You are probably aware of how much you are able to invest in social media, and many brands first create their budget, and then plan their strategies off of it, and that is of course completely fine. Just make sure that your goals reflect the budget you have, because if you set extremely high goals, but are hoping to achieve them virtually for free, chances are, you aren’t. Even if there are always a few exceptions. What roles does the member in your team have? In your strategy, it’s important that you have assigned roles that tells who is managing what. When you know who is responsible for what, you’ll be able to increase productivity, and make sure the work isn’t overlapping or creating confusion, so you’re standing there with a bunch of work that never gets done because no-one has it as their task. Social media is extremely time-consuming. At least if you want to achieve great results, and have set goals that are high. Therefore, having only one person who manages every social media platform of yours is probably a bad idea if you want every single aspect of your social media to be done with quality and in the right manner. Who is going to manage your content creation? Who will interact with your audience? Who will manage customers service? These all highly important questions to ask, and vital parts of a successful social media presence. A social media strategy is vital for social media success. Without having a map that is steering you in the right direction and telling you what your re going to do and where you should go, achieving great results will be difficult. By having a clear social media strategy, you’ll save both time and resources , while at the same time generating better results by working more efficiently.